Very nice diecast of the Mercedes SSK. Approx. 9" long, it has opening doors and hood with engine detail. Long since discontinued by Maisto, we only have 1 left. Approx. 9", it has opening doors, trunk and hood with engine detail. This is new old stock (NOS). The box has shelf and age wear as we discovered it in the back of our warehouse. Long since discontinued by Maisto, we only have 1 left. This is the last of them! 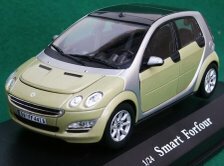 High Quality 1/43 scale (4" long) diecast by Autoart. Comes with a FREE clear acrylic display case. Once we sell out - that will be it - forever! Very nice diecast of the Mercedes ML Class SUV by Maisto. Approx. 9", it has opening doors, tailgate and engine detail. This special version has a chrome front bumper and a spare tire mounted on the tailgate. This is new old stock (NOS). The box has shelf and age wear as we discovered it in the back of our warehouse. Long since discontinued by Maisto, we only have 1 left. 1/24 scale, 6" long diecast that comes in a nice box. The doors, trunk and hood open, and there is glass in the doors like you would find in car models that cost a lot more! The author guides us through the entire history of the brand, its highs and lows, its successes and failures. 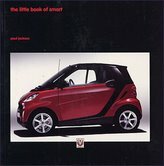 Plus the very latest line-up including the new Smart that was finally brought into the USA. 128 pages with over 100 photos - but this book is small - only 6" square. Extremely hard to find! We imported them directly from the publisher (Brooklands Books) in the U.K. 38 contemporary race reports from leading British and American journals covers the great Porsche, Jaguary, Sauber/Mercedes, and Mazda wins. 172 pgs. Sftbd. 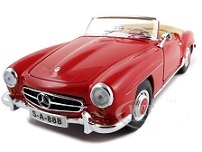 50 Years of Classic Sports Cars features 112 cars from the post-World War II era up to the present day. Superb photographs display the most stunning machines of the last few years, from the Porsche 911 Turbo, Jaguar XKR and Ferrari 260 Modena to the Ford Cougar, TVR Tuscan Speed Six and Shelby Series 1. 30" long, amazing quality umbrella by Autoart. The gearshift handle is removable, and can be used as a flashlight! The nicest umbrella you will ever own.